Slack is a leading team communications tool. Use Slack to bring all of your communication tools into one app - messages, notifications, live communications, files and more. 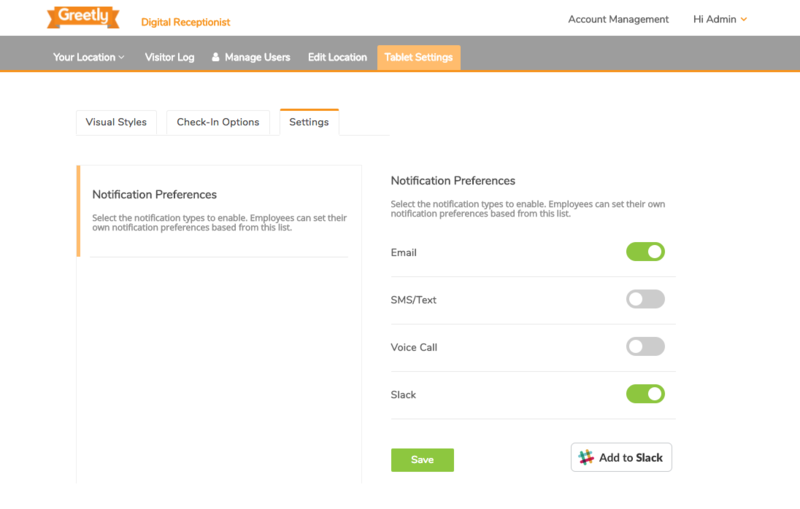 Greetly's Slack integration allows members of your organization to receive digital visitor registration notifications instantly as direct messages within Slack. Go to Check-In Options > Location. You will land in the sub-section "Notification Preferences". Go to Profile Settings to add your Slack username (eg. @johnsmith) and make sure that Slack is set to active in your personal Notifications section. NOTE: Greetly's integration does not currently support display names, so stick to those lowercase usernames until further notice. Start getting Greetly notifications on Slack! HELP! I'M LOCKED OUT! How do I reset my Greetly password? NOTE: Greetly’s Slack integration uses usernames, which are all lowercase.